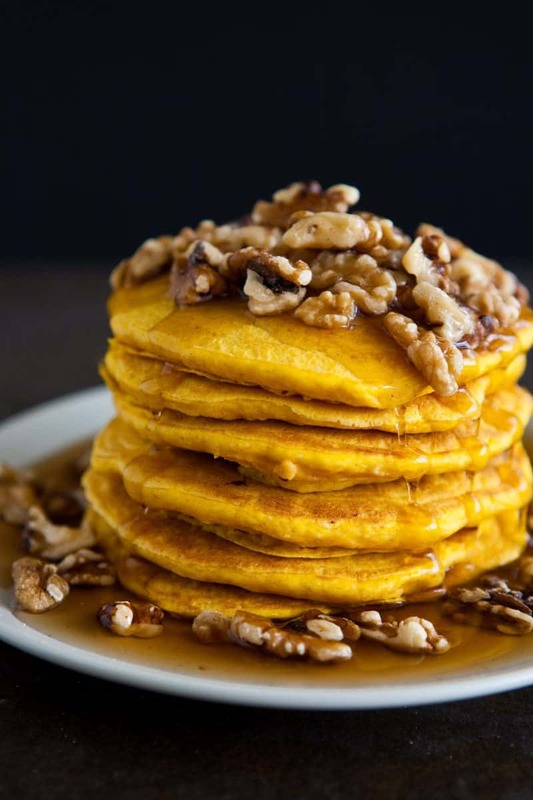 Looking for some scrumptious pancakes to make on Thanksgiving morning? 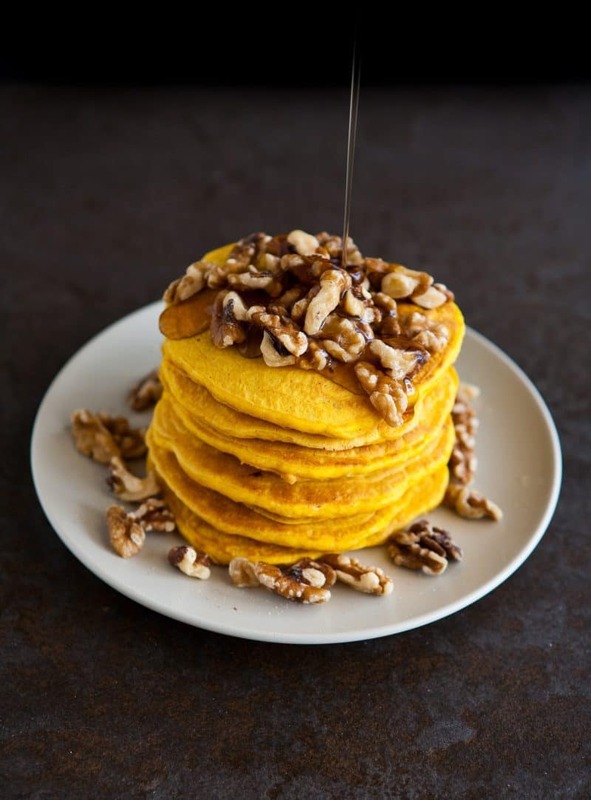 I’ve got the perfect thing, these easy pumpkin pancakes. They’re made with Bisquick, so you know it’s simple. And if you don’t care for pancakes, just make some waffles instead! This batter will work for both. This would be the perfect breakfast for your family to wake up to on Thanksgiving morning. Just pair them with some crisp bacon or smoky sausage. You can enjoy these pancakes while you watch the Mcy’s Thanksgiving Day parade. I topped my pancakes with roasted walnuts and a decadent bourbon maple syrup that’s simple to make. You can omit the booze and nuts for the kiddos though. Maybe top the little one’s pancakes with a sweet cream cheese frosting or spiced whipped cream. You could make the cream cheese icing with a brick of cream cheese, some powdered sugar and some milk to get it a creamy consistency. For a spiced whipped cream, just whip up some fresh cream and add some pumpkin pie spice, and you’re done! Combine Bisquick, milk, eggs, pumpkin and pumpkin spice according to package directions for pancakes. Make pancakes according to package directions. Combine all ingredients for the syrup in a small saucepan and stir well. Heat over low heat until heated through and starting to simmer. 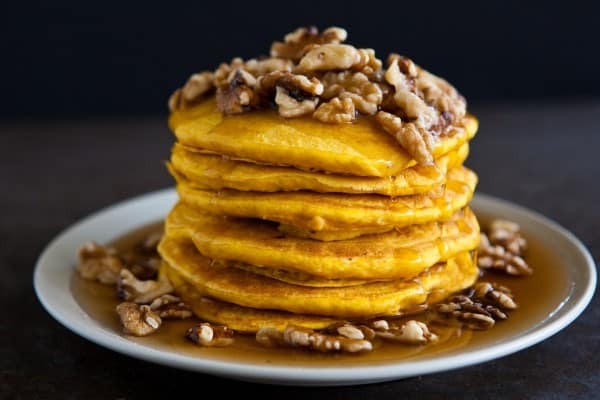 Serve pancakes topped with maple syrup and chopped walnuts. I usually skip breakfist on Thanksgiving because we have a big meal at noon, This year our dinner is later so I will be able to enjoy a nice Thanksgiving breakfast. These look so yummy, for some reason the walnuts is what excited me most about this dish. The amount of perfection here is just out of control. I need these.